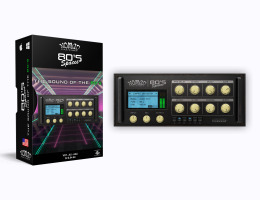 80's Spaces is an original "80’s vibes" plug-in that was initiated by Plugivery CEO Eric Nolot and old time friend Bernie Torelli of Nomad Factory 3 years ago, and is surely the most original and creative plug-in ever built by Nomad Factory. It "magically" reproduces the typical reverbs and space effect units used by legendary artists such as Michael Jackson, Madonna, Duran Duran, Guns N’ Roses, Tears for Fears, David Bowie, Depeche Mode, U2, Eurythmics, George Michael, Phil Collins, Queen and so many others. Your classic gated reverbs, lush, cavernous and sweeping tails, short rooms and chorused verbs are all here with minimal adjustments required in a single-plated interface for use as an insert or on aux tracks with dry/wet control for mix blend, chorus, decay, gate, filter and other parameters at hand.
" I Love, Love, Love 80's Spaces! It's instant record magic on lead vocals. " "The vibe on the 80’s Spaces is perfect!". "The moment I heard it coming back at me, I knew I was back adding reverb to a Bangles vocal :-) And the chorus and width functions are perfect additions for this decade!". Presets are provided by MoReVoX and Nomad Factory engineers to get you started. You may download the full version of 80's Spaces here. Download the 80’s Spaces Manual here.